The Regional Paediatric Dentistry Service provides a Consultant-led Dental service for the diagnosis and management of oral health disorders in children and young people under the age of 16 years (up to the age of 19 years in some special circumstances). Access to the Paediatric Dentistry GA or sedation services. The Paediatric Dentistry Service provides a Consultant-led Dental service for the diagnosis and management of oral health disorders in children and young people under the age of 16 years (up to the age of 19 years in some special circumstances). Secondary care referrals are received from the General Dental services, Community Dental services, General Medical Practitioners from Barrow to Staffordshire. Tertiary referrals are received from Consultant medical colleagues in the Children’s Hospital and other Hospitals within and beyond the North West Region, Dental Consultant colleagues and Community Dental partners throughout the North West region. 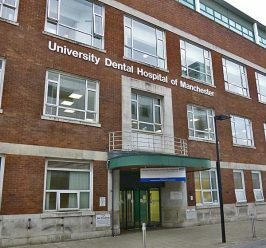 The Regional Paediatric Dentistry Service is located in the Department of Child Dental Health in the University Dental Hospital of Manchester (UDHM) and the Dental Health Unit, Royal Manchester Children’s Hospital (RMCH). The work to refurbish the Department of Child Dental Health and extend the Orthodontic Department on the 2nd floor of the Dental Hospital came to an end in 2011, with the clinic opening on Monday 23rd May. This work included the installation of a new reception desk, three new treatment rooms, and additional space for Orthodontic treatment, as well as refurbishment of the Children’s Clinic and Sedation Suite, including a recovery room. Every effort has been made to provide an environment which is modern, yet welcoming and child-friendly. The open plan clinic now houses 8 state of the art chairs with flat-screen TVs and facilities for ambidextrous working. Children with complex medical problems which may affect the provision of dental care. These children will usually be seen in the Dental Health Unit in Royal Manchester Children’s Hospital, and should be referred to Dr Hood directly. Children with developmental problems, special needs, learning difficulties, autism and behavioural problems, who are unable to co-operate for routine dentistry. Children who have sustained complex dental trauma (e.g. pulp involvement in immature teeth). Children with congenital or acquired dental anomalies who may require multidisciplinary management involving a combined restorative / orthodontic / surgical treatment (e.g. Hypodontia, Amelogenesis Imperfecta, Dentinogenesis Imperfecta, Molar Incisor Hypominerisation, Micro / macro-dontia, supernumerary teeth, infra-occluded teeth and delayed eruption). Children with soft or hard tissue pathology such as oral ulceration, swellings, and cysts. Children with non-contact tooth surface loss, requiring specialist intervention. Children with cleft lip and palate and other cranio-facial anomalies. Children with supernumeraries, odontomes, impacted teeth, submerging teeth, abnormal frenal attachments, and tongue-ties which may require surgical management. Children with extreme dental anxiety who have proven unable to co-operate with routine dental treatment, and may require sedation or treatment under General Anaesthesia (where no local service is available). Routine primary care (e.g. caries in cooperative children, endodontic treatment in permanent teeth with closed apex). Root canal treatment in permanent molars unless there is good clinical indication for retention of the compromised tooth i.e. severe hypodontia. The need for an interpreter if required (specify language). Details of any medical consultants/ specialists / paediatricians involved in child’s care. Copy of any relevant radiographs. Recent treatment attempted (e.g. failed extraction under local anaesthesia). If appropriate the Regional Paediatric Dentistry service provides GA, IV and inhalation services for children from Central Manchester PCT. It also provides a tertiary service for those children who require more complex specialist treatments, or who are unsuitable for GA or sedation in a local District General Hospital setting, or where this service is not available locally. Practitioners are advised to contact their local PCT-DS provider regarding access to local GA extraction services for children, in the first instance. The Regional Paediatric Dental Service does not provide a routine dental access service for children. If a child attends the Dental Hospital in pain they will be directed back to their local primary care provider. If they are not registered with a Dentist, they will be signposted to the NHS Direct local helpline (above) to access one of 30 protected emergency slots across the region. An appointment closest to home will be offered. If they attend the dental Hospital seeking routine care, the helpline will advise on which dental practice closest to their home has capacity. Dental Practitioners wishing to make an emergency referral for a child under their care with acute extra-oral swelling, infection, intractable bleeding or acute dentoalveolar injury, must telephone the Department and speak to the Triage team / Consultant in charge on that day, before sending a patient to the Dental Hospital. Please ring 0161 393 7732 for advice on how we can best help your patient receive the appropriate care..
Inappropriate/ inadequate referrals will be returned. Your compliance with the above guidelines will avoid unnecessary delays in patient care. AIVS has been awarded an RfPB grant.